The other day I got called out (in a very loving way) by my life coach. She wanted to know what my intentions were for SisterLadyGirl. Was I serious about growing the business? What were my plans for continuing to serve the women who were part of this community? I was so caught off-guard by her line of questioning. In that moment, her words stung me and I couldn’t come up with a good answer, even though I knew deep down exactly what the issue was. Ever since I started blogging about the power of personal image, I’ve learned that one of the main reasons why choosing the right clothes seems so hard for some women is because they’re unsure about their intentions. They get really freaked out about affirming who they are and the way they want the world to see them and frankly how they see themselves. In a word, they’re afraid. So they fall victim to the trap of believing what they see. They start to base their style decisions on the latest trends or which celebrity wore which outfit best. Ironically, I started doing the same thing with the blog. I saw other bloggers (some way bigger than me) launching, promoting and partnering and it made me feel inadequate. So, what did I do? I pulled back. But here’s the thing: none of that means a hill of beans when it comes to realistically applying it to who you are, the life you’re leading or why you’re making the choices you’re making. As a result, the way you look, and even my intentions for the blog, ends up being all over the place. It feels random and people don’t know what to make of it. Suddenly, we go from feeling fabulous to flustered. Confidence gets shaken and we second-guess ourselves to the point that it starts to negatively impact us. Exhausting, isn’t it? So, why do we keep doing this to ourselves? Because calling attention to ourselves – whether in a good way or a bad way — is scary as hell. What if people respond negatively? What if people respond positively? What if they don’t respond at all? We allow our fears to dictate our decisions and paralyze us into inaction. I want you to do a favor for me. Take an honest look at the factors that are influencing your current style and the choices you’re making. Is it your job? Are you happy with the way your body looks? Maybe you’re a stay-at-home mom? Write down everything that comes to mind. Then, go to your closet and take a good, long look at what’s there. What story do the clothes inside tell about you and your lifestyle? Is it a story that’s truly representative of the person you feel you really are and ultimately want to be? Jot down why you think it is or why you think it is not. As an educator and advocate of the brave women like you who have decided to take their style into their own hands, here’s my promise to you. 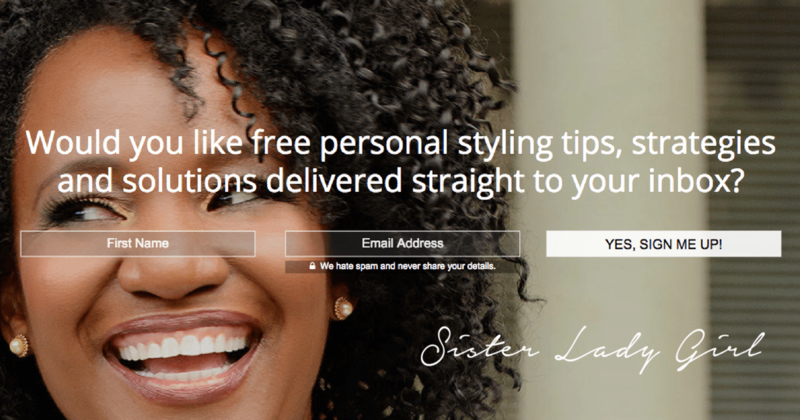 In the coming year, I commit to consistency, to clarity and to serving you in order to grow SisterLadyGirl into the business I envisioned it would become when I relaunched the website in October.